Inserting a narrative into a game treasured for its open play structure is a daunting task, but the PAX preview of Telltale's Minecraft: Story Mode shows a game that delicately balances the two. At first, the Mojang/Telltale collaboration seems like a total contradiction. On one hand, we have a series lauded for it's brilliant writing. On the other hand, we have one of the most limitless and free sandbox games of all time. The Telltale games have a very specific structure, whereas Minecraft has almost no structure at all. 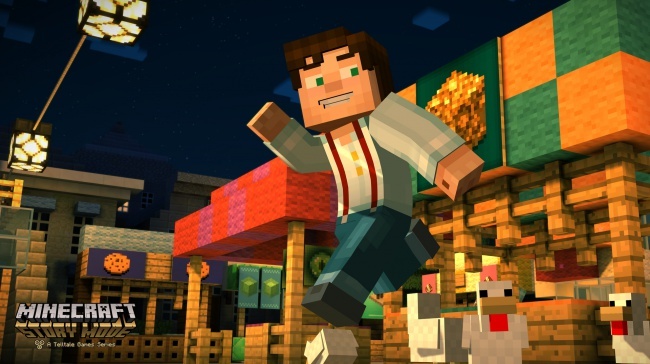 Telltale games offer a singular play experience, while Minecraft has a thriving social community. How on earth would a collaboration between the two manage to stay true to the spirit of two such different types of game? This is the question I asked myself when first hearing the announcement at the end of last year and today, at PAX Prime, I found some answers. 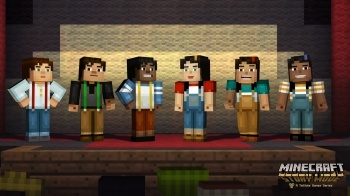 Like other Telltale games, there are elements of Minecraft: Story Mode that will immediately be familiar to Minecraft fans. The distinct, simple blocky art style is spot on. The rules of that universe still apply; within the story, you need to explore, craft weapons, activate portals, and avoid the creepers that come out at night. For the first time in a Telltale game, you can customize your character. There are 3 male skins and three female skins to choose from, and regardless of who you choose, you play as the protagonist, named Jesse. There is a sidebar showing inventory, not unlike the objects held along the bottom of the screen in Minecraft. It's important to note that while these familiarities will certainly be appreciated by Minecraft fans, players who can't tell a crafting table from a creeper will be walked through the basics with ease. Do not be fooled, despite the aesthetic and the adherence to many of the more practical mechanics, this is most definitely still a Telltale game. The preview already shows a driving narrative and that oh-so-familiar "She will remember that" flare. While the environment is certainly reminiscent of the Minecraft universe, it's quickly realized that there are only certain paths you can choose to follow, and only certain objects with which you can interact, in order to keep the narrative moving along. The preview included two different sections of the story. In the first, Jesse must venture out at night to rescue his pet pig who has run off. The character of Jesse is immediately likeable, voiced by Patton Oswalt - or by Catherine Taber should you have chosen to play as a female - and the relationship between the protagonist, his pet pig, and his friend Petra are immediately apparent and relatable. In the second portion of the preview, a giant monster is introduced, forcing all the characters to escape to the nether and demonstrating the QTE combat style the game adopts. No surprise here. The humor is light-hearted and family-friendly and the voice acting for all the characters I encountered was top notch, as I would expect from a Telltale game. Overall, the slices of the story I saw were enough to get me excited about these next five episodes. The characters, story, and humor give charm to an already familiar world, and miraculously, many aspects of creation and freedom remain intact. Mincraft: Story Mode will release fall 2015 and be available on Xbox 360, Xbox One, PlayStation 3, PlayStation 4, PC, Mac, compatible iOS devices (e.g., iPad), Android, and Amazon Fire TV.